Young com­pa­nies tend to know their cus­tomers well and con­verse with them fre­quent­ly in the ear­ly days of the busi­ness. But as they scale to hun­dreds or thou­sands of cus­tomers, this con­nec­tion becomes more dif­fi­cult to main­tain. This is the point when a com­pa­ny needs to deploy the ‘best of breed’ busi­ness soft­ware to be sure you are col­lect­ing the right data, using it in the most effec­tive ways, and pro­vid­ing the most val­ue to your cus­tomers. 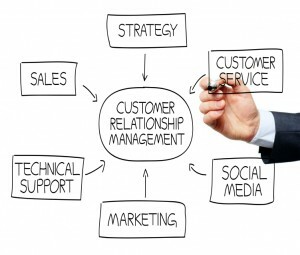 Cus­tomer Rela­tion­ship Man­age­ment (CRM) Sys­tems for man­ag­ing a company’s inter­ac­tions with cus­tomers, part­ners, and sales prospects. Exam­ples: salesforce.com and Sug­ar CRM. Mar­ket­ing Automa­tion Appli­ca­tions to stream­line sales and mar­ket­ing orga­ni­za­tions by replac­ing high-touch, repet­i­tive man­u­al process­es with auto­mat­ed solu­tions. Exam­ples: Elo­qua, Mar­ke­to, Exact Tar­get. Sales Force Automa­tion (SFA) Soft­ware to effi­cient­ly col­lect orders with high sku-counts. Aptus Digi­tial will help you define what you need, leads your imple­men­ta­tion, and train your team to deliv­er out­stand­ing sales and ser­vice.